Really Cool Dude: How Dumb Is This Woman? .....Colorado Elects Only The Best and Smartest to Represent Them to the World!!..... 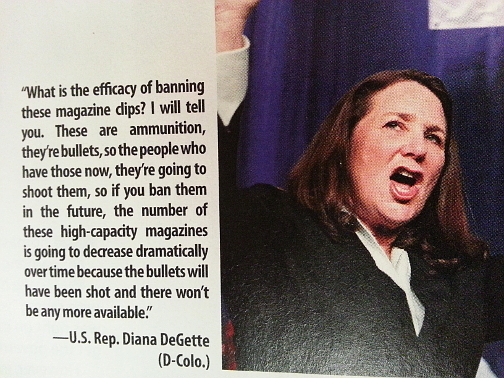 This what they vote for in Colorado…. How dumb can you be? The sad thing is, when someone speaks publically, they usually are speaking from a script, something that has been reviewed and edited. So, not only is this woman an idiot, her staff is apparently very lacking in the knowledge area. This picture was taken from the latest issue of American Rifleman (June 2013, page 18). Elsewhere in the same issue, there was another article on a similar strain (“U. S. Lawmakers Trying to Ban Before They Understand”, page 88) and in that article when it refers to this comment, a spokesperson clarifies the statement at left, “…she simply misspoke in referring to ‘magazines’ when she should have referred to ‘clips’, which cannot be reused because they don’t have a feeding mechanism”. Well, I guess we now know why her statement, if it was a prepared statement and spoken from a script, was never caught by her staff. It’s one thing to strongly support your constituents, but come on! !, at least know what you are talking about. People – think before you vote! !